Keep up to date with surf tips, lifestyle, travel, food , health, fitness and all things surf here! NEW DEMO BOARDS TO TRY FROM THE SALTY SHAPER! The low down - March Surf Coaching Weekend! 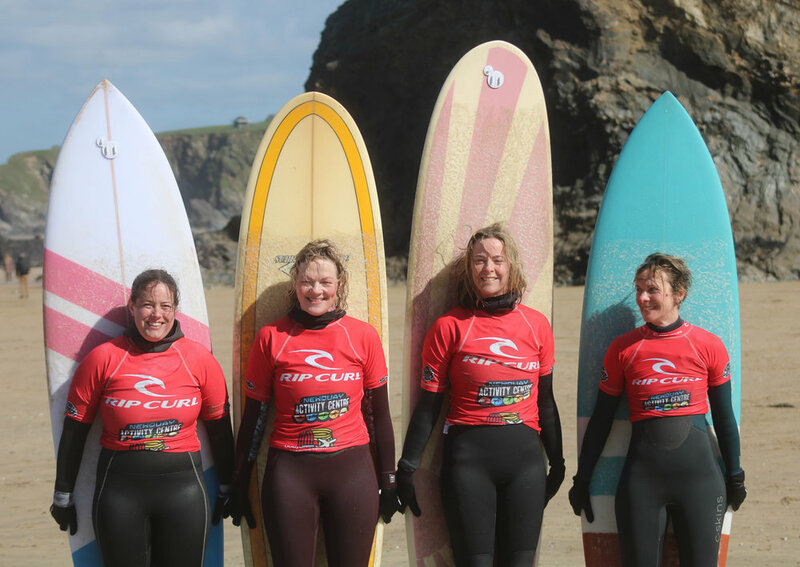 Check out what went down on our latest Women + Waves surf coaching weekend in Newquay this March. Buying your first surfboard can be a mindfield for mistakes. Follow our 5 simple tips to make sure you get the best board for you. Women + Waves Top 10 Instagram Accounts of Water Women Worth Following! Our top 10 water women we are loving to follow at the moment. What's in store for 2019! 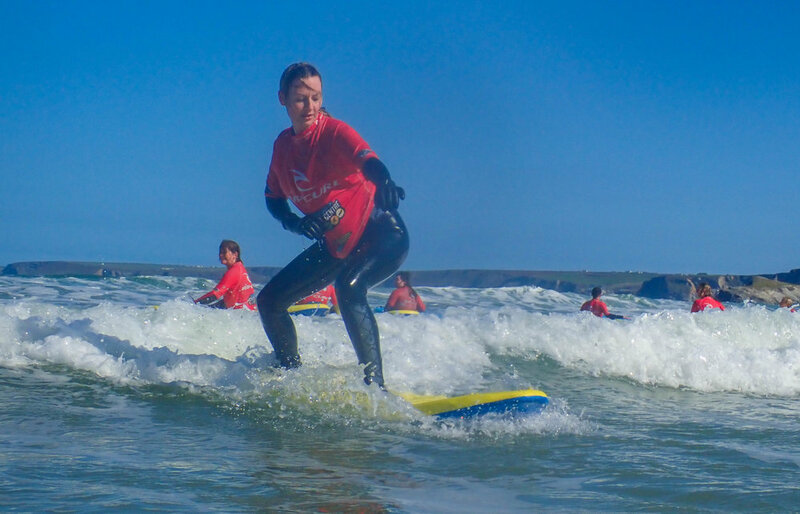 We teamed up with our partners in crime Newquay Activity Centre to host another one of our jam packed surfing weekends. This was our biggest weekend yet with 22 awesome ladies attending. We divided the girls into three separate groups to suit each of different abilities. This meant everyone got plenty of attention and we could really focus on their technique and improvements. Even with fresh conditions forecasted on the Saturday, our spirits weren’t dampened . After a quick meet and greet, goals were set and we were ready to get suited and booted. We didn’t waste any time and got down to the beach as quick as possible for our first lesson of the day. The conditions were challenging, but practicing in these tricky conditions makes for better surfers. After all, you can’t control mother nature - you’ve got to embrace it! After the first morning session, we eagerly tucked into our lunch and got ready to view our video analysis. We eagerly watched the playback from the morning sessions whilst enjoying a warm cuppa. This helped the ladies see where we needed to make improvements for the afternoon session. After our food digested we quickly got back into our wetsuits, ready for round two! The afternoon conditions were fun and there were plenty of waves to be had by all. After a long day of surfing and laughing our heads off, we had a lovely meal at The Stable on Fistral Beach. It never disappoints, serving up the best hearty food. We indulged ourselves in plenty of delicious pizza and tested the local Cornish cider. We deserved every single part of it and needed plenty of energy for our next day in the water. It’s a really great way for everyone to meet each other, talk about the days surfing and get to know our instructors a little better. When we woke up on Sunday morning, we carried out our daily surf check. It was almost as if we had woken up in another season; we had glorious blue bird skies and super fun 2-3ft conditions. We watched over our video analysis, shot back some coffee and jumped right back into the water. We had a great morning surfing and sharing plenty of party waves together! Froth levels were high! It was such a lovely weekend and we can’t wait for the next one in May! We’ve all made some 'surf friends' for life too! We all went home with a goodie bag sponsored by our local surf shop ‘Watershed’ which was filled with epic goodies! We alway promise to maximise your surfing fun throughout the weekend by making sure that you are in the right place, getting the best waves for your ability. Our surf coaching weekends are open to all. Please don’t feel that you are too good or too inexperienced for these weekends, they are completely inclusive. We make sure we put you in groups of ability which will see you developing your skills with like minded women of a similar level. The weekends are very social, we get results but it certainly isn’t a boot camp.